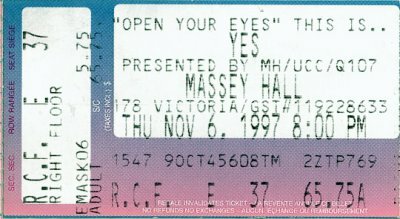 In 1997, for the OYE show at Massey Hall in Toronto, I convinced my wife (now ex *grin*) to wear a paper mach� "pregnant stomach" doohickey, covered in foam and strapped on under an oversize sweater....inside was a small handicam, and a little hinged door to allow access to the camera. Took absolutely ages to make and get right. I also brought along binoculars and case. Once inside the hall, I removed the camera and slipped it into the empty bino case, and I commenced to vid the show. I no doubt looked like a real moron holding up a bino case towards the band for 2 and a half hours, but it turned out great, my all time fave YES vid! I attended the Talk tour in '94. My concert experience prior to 1994 was 20 years earlier, ELP in Vancouver! So I am not one of these concert-going-professionals that I read about in a.m.y. This latest show was far superior to the Talk tour. I had never seen Howe live. I play a smattering of guitar, and thought I had figured out little bits of Yes music, but to watch this guy play made me really appreciate his awesome talent. Igor is a great addition. Some have said he does not add to the visual presentation (vis a vis Rick). I got the impression that he did not want the spotlight on himself, out of let's say respect for the 'classic' members of Yes. At the end of the show though, he was quite animated in accepting the applause with the other members, and quite rightly so. Same comments about Igor apply to Billy Sherwood. He stayed in the background, not attracting attention, until his main parts (read: Rabin guitar solos) came up. And it was great to see him trade solos with Howe at the end of Starship Trooper. One of the most interesting things of the evening was Chris hitting those bass pedals. I was glad I wasn't wearing a pacemaker, because those bottom notes vibrated my entire body when he hit those pedals. For the most part the sound was great, but I noticed that several times Chris and Billy's mikes did not seem to be on. Can you spell "lip sync"? The set list has nothing too unusual in it, but I include it for completeness, and to add a few comments of my own in some sort of chronological order. This caught me by surprise, because I was expecting Rhythm. I guess I wasn't keeping up with a.m.y!!! Sherwood solos, Howe endures. But I like the song! Why do they always play this thing live? This is my choice for the Fast Forward button when I am in the car. Jon sang, "on the bus to Toronto", and most of the crowd did not even notice. Canadians, eh? I like this song. My wife *really* likes this song. And Billy was having fun with someone in the balcony, because he kept looking up there and laughing with someone. Just beautiful, both of these. My wife says, "These are my favourites"
And I am just stunned, watching this guy's fingers fly over the frets. Another new one I like, although I like the more up-beat demo version from Yesoteric better. Jon mentioned that the last time they were in Toronto (Talk tour?) he had played this live on a local radio station. Billy in the spotlight again, but then they go into a high energy ending, and Howe really rocks. During this song, some guy in a white tshirt was dancing in front of the stage. The weird thing is that he looked like Billy's twin brother (with 25 extra pounds). Eery. These last two were magic moments. In one of these songs a young lady jumped up on the stage and grabbed one of Jon's upstretched arms. The security guys started moving out from the darkness, but she quickly jumped off the stage again. Jon and Chris got us all up on out feet to sing this song with them. It was a lot of fun. And we were on our feet for the rest of the show. Sounds better than ever. And what a great new ending!!! Hang on to your hats for this one, if you haven't heard it yet. First a word about Massey Hall. This is the finest of many concert halls to be found in Toronto, and if anyone reading this has a chance to catch a show there it comes highly recommended. Built in 1894 in the Theatre District, if there truly is such a thing in T.O., it has seen the best acts from the World over. Seating capacity is limited but this lends to a more intimate surrounding, as witnessed by the few who reached up and received a friendly hand shake from Jon. I am no historian but I have seen a few shows at this venue, ie... Squeeze, Joe Jackson, Santana, and truly believe that it is the best place for a Rock Show in town. My seating was not "choice", as I was off to the side on the second balcony, so the sound from my vantage point was a bit dulled. However, given some time, my ears adjusted. It does not matter for these are truly some of the worlds most talented musicians, and just watching them strut was a sight to behold. From the opening licks in Siberian Khatru one fealt that this evening was going to be special. Steve Howe was firing on all cylinders, and Jons' vocals were bang on, how does he do it. Alan White ... rock steady as usual, and Billy Sherwood more than satisfactory. Igor, lets face it, we have all been guilty of scrutinizing this young mans abilities, and well I am impressed. He obviously has done his homework and ripped thru Wakemans' solos without a hitch. Nevertheless; Rick you are missed. Chris Squire, what a talent, pity he can't dress himself. I fealt sorry for him a couple of times when I didn't think he was going to get back up after falling to his knees. A superb bass player and the cornerstone of the bands wonderful harmonies, like most bass players, has an ego the size of Everest. God love him. Although it would have been nice to hear some newer material I can't bring myself to complain about the set list.Several rousing renditions of classics followed by just as many standing ovations left me in awe of these graduates of the London Marquee club. Most pleasing was Jons' spirituality and the gift his voice brings, and the verve in which Steve Howe attacks his songs. All in all an experience I'm not soon to forget. Quite an Autumn I've had, just two weeks ago I had a chance to see Jethro Tull in a bar no less. And now Yes. A little "Starless and Bible Black" and my year will be complete.